The Fernley 4th of July parade started with enough time for the traffic to clear that might have made it tricky to get away from the house, and Lisa drove me to Reno, where I was there sufficiently early that I did not have to rush or fret at all. The flight was very full, but I did have an aisle seat. The descent into Denver was rather bumpy. Well, actually, it was a lot bumpy, but the landing itself was smooth enough. 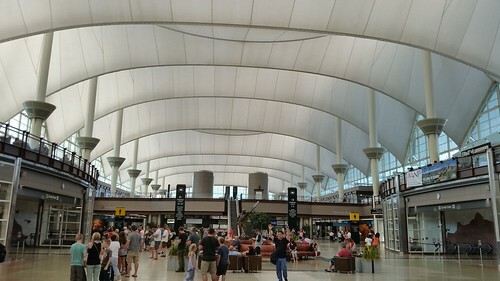 This was the first time I've traveled to Denver by air rather than through it. I'd never seen the main concourse before. I was to meet Lindadee at DEN, with her flight coming in about 30-45 minutes after me. Our wires got crossed; the displays at the airport said her flight's luggage was at claim 1, when it was actually at 8, and I'd forgotten to turn my phone back on. Eventually I figured it out. After sorting things out and connecting with Linda, we walked to the airport train station, where we bought tickets for the A Train. 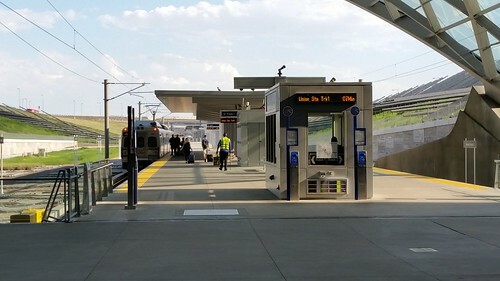 This is not a light rail line, but a electrified conventional heavy rail line that runs from Denver International Airport to Denver Union Station. 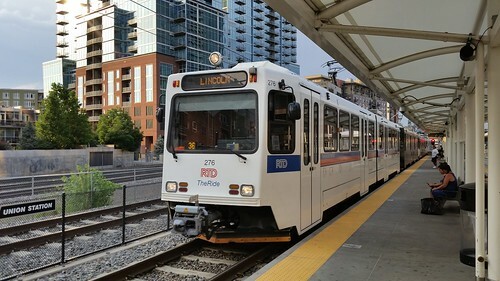 The fare is $9 (which includes all other transit including light rail and buses), the trains run every 15 minutes, and it takes about 40 minutes to get downtown. 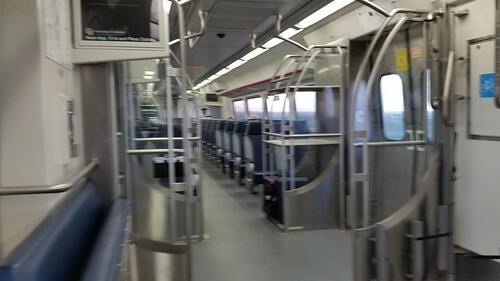 This is a fairly spacious train, with luggage racks (thank goodness) and 3-2 commuter-rail type seats. 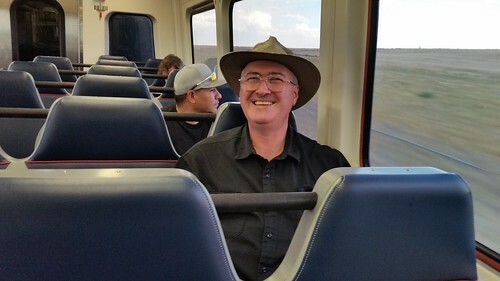 Linda took this picture of me enjoying the ride downtown. When the train pulled in to Denver Union Station, it finally dawned on me that I'd missed a trick: the Giants were playing the Rockies at Coors Field! I could have checked my luggage at Union Station and attended a Giants game! Oh, well, the Rockies won the game anyway, by the improbable-by-Coors-Field-standard score of 1-0. After a few minutes at Union Station figuring out the signs, I realized we needed to walk a few blocks to the light rail platforms. There, we caught the E train toward Lincoln. 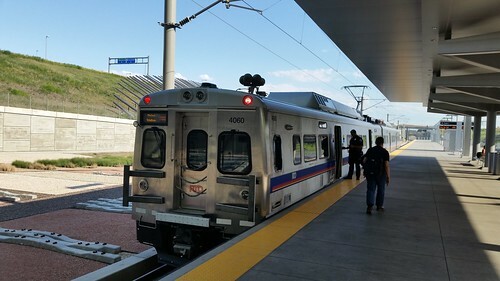 This was when I discovered that the Denver light rail, unlike the heavy rail, has lots of steep steps, which is not fun with a 22 kg piece of luggage, but I managed it. Riding light rail to Bellevue, we still had an approximately 1 km walk to the hotel. 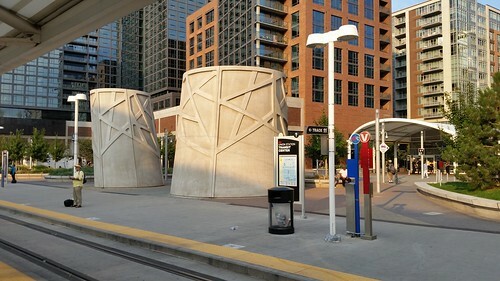 After checking in, we discovered that the hotel would have come over and collected us and will take us back to the light rail station upon request. This will be handy on Sunday when I fly home. After checking in to our respective rooms, Linda an I went up to the 12th floor, where registration was located this evening and where an opening night event was happening. There we caught up with David Clark, with whom I'm sharing the room, and upon advice of Kevin Roche and Andy Trembley (who arrived earlier today), the three of us walked to the Baker Street Pub. They have pub food. The fish and chips were good enough. Walking back, we could hear fireworks going off in the distance, but couldn't see much. Returning to the 12th floor, we could see some fireworks displays around the area in the distance. But the travel was catching up to me, and I do have an 11 AM panel tomorrow morning as I'm moderating the Fannish Inquisition panel for future Westercon (and Worldcon and NASFiC, time permitting) bidders, so I headed for the hotel room to finish unpacking and get ready for bed.